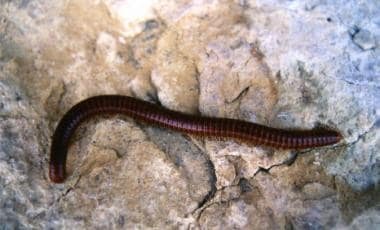 The desert millipede, Orthoporus ornatus. Photo by Robert Norris, MD. Millipede contact injury on day 3 following exposure. Some species are capable of squirting these liquids to distances of up to 80 cm. Most envenomations occur from direct contact of the millipede with the skin. Hare T. Poisonous Dwellers of the Desert. Tucson, AZ: Southwest Parks and Monuments Association; 1995. Peters S. A Colour Atlas of Arthropods in Clinical Medicine. Barcelona, Spain: Wolfe Publishing Ltd; 1992. Nguyen AD. Discovery of a new millipede species in northern Vietnam, and the proposal of a new genus, Parariukiaria (Diplopoda, Polydesmida, Xystodesmidae). Zootaxa. 2016 Jun 9. 4121 (3):331-6. [Medline]. Golovatch S, Evsyukov A, Reip H. The millipede family Polydesmidae in the Caucasus (Diplopoda: Polydesmida). Zootaxa. 2016 Mar 1. 4085 (1):1-51. [Medline]. Wynne JJ, Shear WA. A new millipede, Austrotyla awishoshola n. sp., (Diplopoda, Chordeumatida, Conotylidae) from New Mexico, USA, and the importance of cave moss gardens as refugial habitats. Zootaxa. 2016 Feb 25. 4084 (2):285-92. [Medline]. Nguyen AD, Golovatch SI. The millipede genus Enghoffosoma Golovatch, 1993 recorded in Vietnam for the first time, with descriptions of three new species (Diplopoda, Polydesmida, Paradoxosomatidae). Zootaxa. 2016 Jul 20. 4139 (2):151-66. [Medline]. Williams LA, Singh PD, Caleb-Williams LS. Biology and biological action of the defensive secretion from a Jamaican millipede. Naturwissenschaften. 1997. 84(4):143-4. [Medline]. Shimizu N, Kuwahara Y, Yakumaru R, Tanabe T. n-Hexyl laurate and fourteen related fatty acid esters: new secretory compounds from the julid millipede, Anaulaciulus sp. J Chem Ecol. 2012 Jan. 38(1):23-8. [Medline]. Stanković S, Dimkić I, Vujisić L, Pavković-Lučić S, Jovanović Z, Stević T, et al. Chemical Defence in a Millipede: Evaluation and Characterization of Antimicrobial Activity of the Defensive Secretion from Pachyiulus hungaricus (Karsch, 1881) (Diplopoda, Julida, Julidae). PLoS One. 2016 Dec 1. 11 (12):e0167249. [Medline]. Hash JM, Millar JG, Heraty JM, Harwood JF, Brown BV. Millipede Defensive Compounds Are a Double-Edged Sword: Natural History of the Millipede-Parasitic Genus Myriophora Brown (Diptera: Phoridae). J Chem Ecol. 2017 Feb. 43 (2):198-206. [Medline]. Makarov SE, Bodner M, Reineke D, Vujisić LV, Todosijević MM, Antić DŽ, et al. Chemical Ecology of Cave-Dwelling Millipedes: Defensive Secretions of the Typhloiulini (Diplopoda, Julida, Julidae). J Chem Ecol. 2017 Apr. 43 (4):317-326. [Medline]. Erickson TB, Marquez A. Arthropod envenomation and parasitism. Auerbach PS, ed. Wilderness Medicine. 6th ed. Philadelphia, Pa: Elsevier Mosby; 2012. Chapter 50. Hendrickson RG. Millipede exposure. Clin Toxicol (Phila). 2005. 43(3):211-2. [Medline]. Mason GH, Thomson HD, Fergin P, Anderson R. Spot diagnosis. The burning millipede. Med J Aust. 1994 Jun 6. 160(11):718, 726. [Medline]. Radford AJ. Giant millipede burns in Papua New Guinea. P N G Med J. 1976 Sep. 18(3):138-41. [Medline]. Radford AJ. Millipede burns in man. Trop Geogr Med. 1975 Sep. 27(3):279-87. [Medline]. Dar NR, Raza N, Rehman SB. 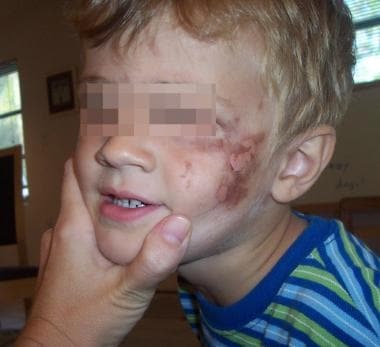 Millipede burn at an unusual site mimicking child abuse in an 8-year-old girl. Clin Pediatr (Phila). 2008 Jun. 47(5):490-2. [Medline]. De Capitani EM, Vieira RJ, Bucaretchi F, Fernandes LC, Toledo AS, Camargo AC. Human accidents involving Rhinocricus spp., a common millipede genus observed in urban areas of Brazil. Clin Toxicol (Phila). 2011 Mar. 49(3):187-90. [Medline]. Verma AK, Bourke B. Millipede burn masquerading as trash foot in a paediatric patient. ANZ J Surg. 2014 May. 84(5):388-90. [Medline]. Hudson BJ, Parsons GA. Giant millipede 'burns' and the eye. Trans R Soc Trop Med Hyg. 1997 Mar-Apr. 91(2):183-5. [Medline].